Old map by ASHBY - A map of the Worcester area as defined for the production of wines of origin . . . Title: A map of the Worcester area as defined for the production of wines of origin . . . Size: 19.5 x 16.1 inches. Condition: Some marginal staining and upper right corner teared off, but generally in good condition. On the verso a descriptive text of the region. 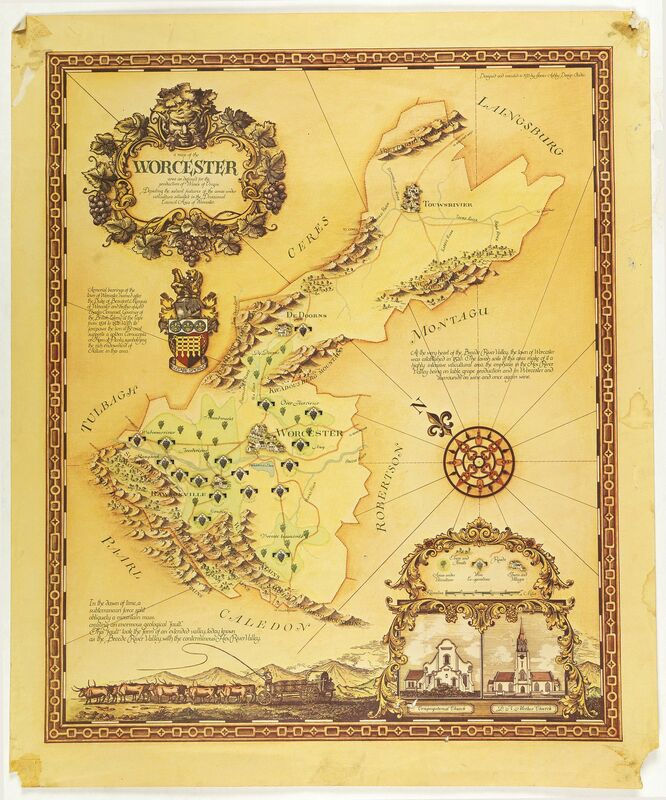 Decorative map of Worcester, a wine area in South Africa. The Cape winelands stretch from the rugged mountains and multi-directional slopes of the coastal region to the open plains of the Klein Karoo where viticulture takes place mainly in the riverine valleys. South Africa's vineyards are mostly situated in the Western Cape near the coast. There are five regions in the geographical unit of the Western Cape – Breede River Valley, Cape South Coast, Coastal Region, Klein Karoo and Olifants River – and Boberg (for use in respect of fortified wines from Paarl, Franschhoek, Wellington and Tulbagh). Another five geographical units exist: Eastern Cape, Free State, KwaZulu-Natal, Limpopo and Northern Cape. The South African winelands encompass 27 diverse districts and some 77 smaller wards in total.